Thanks to Daniel Richman for the earthmaths.py code that performs most of the tricky bearing/distance calculations. Thanks to Noel G8GTZ for patient testing of early versions. Edit the config.json file for your station, for details see Configuration. Double-click the shell.bat file, that will give you a command shell in the directory. Type: habrotate-cli.exe and press enter. If this doesn't give you an error, double-clicking on habrotate-cli.exe directly will work in the future. Select the flight by typing in it's number, and pressing enter. 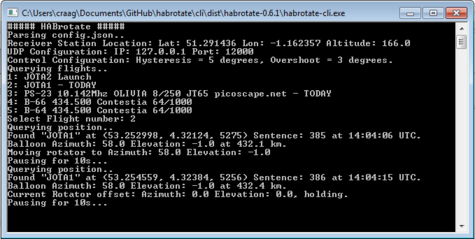 The program will now query habitat for the flight's latest position (from any payload) every 10 seconds, calculate the Distance, Azimuth and Elevation and send the UDP Control String to PstRotator. Enter the Latitude, Longitude of your station, specifically the antenna rotator, here. "auto" will cause this to be queried from the Google Maps API. Only used for Elevation, so you can leave this as auto unless you have an AZ/EL setup and the Google Maps value is inaccurate. These are where habrotate sends the control packets to, and should be the client PstRotator interface. If you are running it on the same machine then the defaults will be fine. The rotator will not be moved unless the error is great than the number of degrees specified by hysteresis. Movement of the rotator will then overshoot by the specified number of degrees to minimise rotor movement. Overshoot must be small than hysteresis, or else oscillation could occur. The program will not run in this condition. This page was last modified on 18 October 2014, at 14:20.